When Eddie Martin was nineteen years old he stood six foot one-and-a-half, weighed one hundred and thirty-eight pounds, and looked like a cross between a picket fence and a bamboo rake. Eddie, however, was not what you would call burdened down with dreams of physical perfection. He thought barbells were young ladies who worked in cocktail lounges, wouldn’t have known a weightlifter from an elephant, and the only bodies he ever noticed were on girls. Girls were, in fact, Eddie’s principal interest. He had a closet full of cool threads, a handsome if skinny face, and a head of thick black hair which he had secretly styled at twelve bucks a pop. Eddie was just entering young manhood and he intended to make his entry a notable one. Eddie’s worries, as it turns out, were not entirely without substance. His girlfriend declined a stroll through the park on the way home because, as she pointed out, it was dark in there and a girl might not be safe with the type of protection some of them were stuck with these days. She refused a hamburger but observed that it might be a splendid idea if Eddie ate about a dozen of them. She said goodnight to Eddie at her front door – she had a blinding headache it seemed and couldn’t invite him in – and observed with deep regret that she was going to be frightfully busy in the foreseeable future. Eddie charged home, ripped off his shirt, stood in front of his bedroom mirror, and cursed muscles and the movie industry in general, and Reg Park in particular. The next morning, after a restless night plagued by nightmares of 20” biceps and vanishing girlfriends, Eddie wandered into a newsstand to pick up something to read. He let his gaze roam listlessly over the available selection and then jerked rigidly to attention. 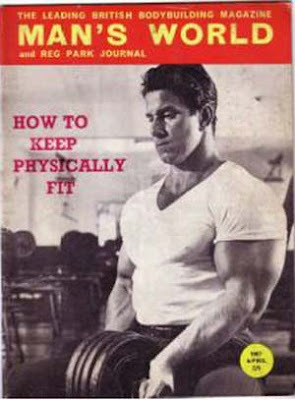 There, right before his eyes, was the Herculean figure of Reg Park gracing the cover of a garishly colored magazine. Eddie peeked furtively about and saw that no one was looking. He seized the magazine, paid for it, tucked it under his coat, and raced home like a starving rabbit. When Eddie got home he read the magazine from cover to cover in one sitting, although, since three-quarters of it was advertising, this was really no great feat. 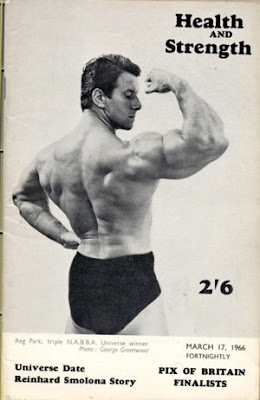 Reg Park, he read, owned 20” arms, was the product of a musclebuilding system that bordered on the miraculous, and that he – Eddie – could have arms the same size in no time at all or even sooner. Eddie was convinced. He ordered the weights and the wonder system and commenced his search for big arms. Five years later, sadder but no wiser, he was still searching. Eddie, it must be admitted, tried hard. He triple-zapped and power-zoomed as conscientiously as could reasonably be expected of anyone’s pupil. He blitz-blasted and force-flushed until his eyeballs felt like they were coming out of his head. Results, however, were not quite as promised. Eddie got a little stronger and a bit harder and his arms grew to almost 15”, but he looked more like Arthur Treacher than Reg Park, and, while the girls did not desert him quite so blatantly anymore, neither did they swoon in groups when he strolled by in his T-shirt. One sunny summer day Eddie stood looking at himself in the mirror and began to have doubts about the whole thing. The work, it was obvious, was all out of proportion to the results, and it didn’t need a Mr. Spock to deduce that the logical move was to chuck the whole scene. Five years of toil, however, represented a large investment, and Eddie decided to seek professional help as a last ditch measure. Eddie cleaned up, put on his newest T-shirt, and drove downtown to the premises of a small commercial gym. He inspected the muscle pictures in the window somewhat wistfully, and then stepped inside. Eddie peered around the gym and through a doorway where the gym owner sat in a shabby sweater behind a desk with a ham sandwich the size of a manhole cover in one hand and an open can of beer in the other. Eddie walked into the office. Eddie wiped the mustard off his hand and sat down. Eddie cleared his throat. “It’s about training,” he said. “I’ve been training,” Eddie said. “You don’t think they look anything like Reg Park’s?” Eddie asked. Does your Aunt Gertrude have big arms?” Eddie asked him. “What do you mean?” Eddie asked him. “What would you suggest?” Eddie asked him. “Gain Weight,” the gym owner said. “I never heard of it,” Eddie said. “What’ll it do?” Eddie asked him. “And you think I’ll get big arms?” Eddie asked. Eddie got up and left. The gym owner dug into the bottom desk and brought out another sandwich. He reached into the portable cooler under the desk and came up with a can of beer. He popped the top, put the can to his mouth, and swallowed half the contents. “Smooth,” he murmured. Eddie Martin reported to the gym on Monday. The gym owner met him with a big smile. “It’ll be beautiful if I get them,” Eddie muttered. Don’t you ever have any failures?” Eddie asked him. “Eddie boy,” the gym owner said, “the only failure we ever had was an electrical failure last July, and that was just because some idiot hung a wet jock-strap over the fuse box. “I think so,” Eddie said. “I could gain weight without it, couldn’t I?” Eddie asked. You might,” the gym owner said “eventually. But you haven’t got two hundred years to spend on this project. This is going to be a three month crash program. You’re gonna gain about a ton of weight and change your arms from skinny ones to big ones, but you’ll need the Quick Gain Weight to do it. “You see,” the gym owner said, “there are three essentials to gaining weight and building up your arms. You need protein, you need calories, and you need the right exercise so that you assimilate the protein and the calories, turn them into muscle, and the put muscle where you want it. You’ll get the right exercise here, but you’ve got to get the protein and calories somewhere else and the best place to get them is form Quick Gain Weight. “You should mix up what I call the Get Big Drink,” the gym owner said. “Why do you call it that?” asked Eddie. “Why do you think I call it that? Cause you get big if you drink it, that’s why. Drink it like I tell you and you’ll gain weight like a baby whale,” said the gym owner. “What is it?” asked Eddie. “Alright,” the gym owner said. “Listen. Pour two quarts of milk in a bowl and add at least a day’s supply of the Quick Gain Weight. Now add two cups of skim milk powder and blend it. Next add two eggs, four tablespoons of peanut butter, half a brick of chocolate ice cream, a banana, four tablespoons of malted milk powder and six tablespoons of corn syrup. Blend it all together. Pour the mixture into a big plastic jug and keep it in the refrigerator. That much of the Get Big Drink contains approximately 200 grams of protein and 3,000 calories and includes everything you need but an after dinner speaker. There’ll be about ten glasses in the jug and you drink it throughout the day. Don’t try to drink it all at one sitting and don’t drink it in place of your regular meals. Spread it out over the day. You should take a glassful every hour or so. Mix up a fresh batch every day and drink it seven days a week. Don’t cheat on it. You’re only cheating yourself. This supplement will make the difference between grinding slowly along and gaining the weight you need quickly. Eddie took off his clothes and stepped on the scales. “One-seventy-three,” the gym owner said. Make a muscle.” He took a tape measure out of his pocket and wrapped it around Eddie’s flexed arm. “Just under fifteen,” he said. “Don’t enter any Mr. Universe contests. Eddie put on his sweats and spend ten minutes warming up. “Great,” the gym owner said. “That’s the idea. Always take time to get your muscles warm. It may seem like wasted effort, but it pays off in the long run. “Now,” the gym owner said, “you’re ready to go, and the first exercise is the Press Behind Neck. You do 2 sets of 12 reps with a wide grip and in very good style. Use the same weight for both sets. It’s a good basic exercise and it’ll give you just enough work to stimulate growth in the shoulder region. “The next exercise,” the gym owner said, after Eddie finished the presses, “is the standard Bent Forward Rowing motion. That’ll work the heavy muscle groups in your back and help you add bulk. Do 4 sets of 15 reps. Take a light weight for your first set, jump it 30 lbs. for the second set, and then drop it 10 lbs. for each of the next two sets. Use a close grip – thumbs about 3” apart – and pull the bar to your lower abdomen. Arch your back and contract your muscles when the bar is at your abdomen and let it round out for a good stretch when the bar is at arm’s length. Don’t be obsessed with the amount of weight you can lift. Use a good weight, but make sure you do the exercise in flawless style. “What’s that?” Eddie asked him. “No confusion,” the gym owner said. “Squats are the key exercise in any gaining program. They’re the number one movement for adding bulk. They’ll do more for your arms indirectly than all the concentration curls you’ll do in the next twenty years. ‘Warm up well,” the gym owner said. “Do some free squats and some prone hyperextensions until till you think you’re ready and then go right into the squats. You’ll do one set of twenty reps and you should put more into that one set than in all the rest of the program put together. Use all the weight you can and try to add to it every workout. You’ll have to work up to well over 300 lbs. for the full 20 reps. Keep your head up and your back flat. Take three enormous breaths, hold the last one and squat. Go to about parallel position – tops of thighs parallel to floor – and back up as forcefully as you can. Exhale vigorously when you’re almost erect, take three more huge breaths and squat again. “The 10th or 12th rep should feel like your limit,” the gym owner said, “but you keep on squatting until you’ve done 20. That’s how hard you’ve got to work. “Now,” the gym owner said, “when you’ve finished the 20th rep, you drop the weight back on the rack and go immediately to a bench and do 20 light pullovers to stretch your rib-box. Don’t use much weight, 15 or 20 lbs. is plenty. The important thing is to breathe deeply and get a good stretch. “And now,” gym owner said when Eddie had finished, ‘just lay there and take a nice ten-minute rest. If you don’t need the rest, then you’re not working hard enough on the squats. “The next exercise,” the gym owner said, “is the Bench Press. You do 3 sets of 12 reps with a medium grip. Use a moderate weight for your first set, jump it 40 lbs. for the second set, and drop it 20 lbs. for the third set. Keep your elbows out and make your pecs do the work. “And the next exercise,” the gym owner said, “is the Stiff-legged Deadlift. You do 1 set of 15 reps. Stand on a block so that you can go way down till your knuckles touch your shoes. Arch your back at the top of the motion and round it out at the bottom. Hang on to the bar when you finish the 15th rep and do as many shrugs as you can. Try to do about 15 shrugs before you have to put down the weight. “Now you can take another rest,” the gym owner said. “I know,” the gym owner said, But that’s okay. You’re not supposed to get too tired. This program is designed to build you up, not wear you out. “Okay,” the gym owner said. “We’re ready to work the arms now, and the first exercise is the regular Barbell Curl. You do 4 sets of 10 reps. Use your heaviest weight for the first set, and drop the poundage 10 lbs. for each of the remaining sets. “And the next exercise,” the gym owner said when Eddie finished the curls “is Parallel Bar Dips, 4 sets of 10. Keep your body as upright as possible and make your triceps do the work. Tie weights around your waist for added resistance, all you can handle for the first set, and ten lbs. less for each of the remaining sets. “Now,” the gym owner said, “we got to the curling stand for One-Arm Dumbell Curls. Alternate arms and do 4 sets of 12 reps each. Use the heaviest dumbell for the first set and ten drop it 5 lbs. for each of the succeeding sets. Put a lot of concentration into it. “And the final exercise,” the gym owner said, “is Triceps Extensions with the Floor Pulley. Do 4 sets of 12 with your best weight for the first set and 10 lbs. less for the remaining sets. “That’s swell,” the gym owner said. “And don’t forget – work hard, take the Get Big Drink, and watch the results. Eddie Martin walked through the gym and into the office. The owner was sitting with his head in his hands, a worried look on his face, and his eyes fixed hypnotically on a chess board set up on the desk in front of him. The gym owner put his hand to his mouth and chewed at his thumbnail. The gym owner took his thumb out of his mouth and waved to Eddie without taking his eyes off the board. Eddie walked over to the desk. “What’s up?” he asked. The gym owner looked up. His eyes had a glazed look. “Postcard chess,” he said. “I play postcard chess with my nephew.” He studied the board again. Eddie leaned over the game. “You can see the problem,” the gym owner said. “You certainly will,” Eddie said. The gym owner put his head in his hands again. Eddie walked around behind him and they both looked at the board for a long time. Finally, Eddie reached over the gym owner’s shoulder and picked a Knight off the board. “Whatta the horsies do?” he said. The gym owner sat motionless for a full minute, and then very slowly he turned his head. “What did you say?” he whispered. Eddie cleared his throat and held up the Knight. “I asked what the horsie did,” he said. “The second month of what?” the gym owner said. “Good,” the gym owner said. “That’s splendid.” He took a pad of writing paper out of the drawer and laid it on the desk. “Okay,” he said. “You’re going to do a little more advanced program, but the emphasis will still be on gaining weight.” He wrote on the pad and then looked up. “Are you still using the Get Big Drink?” he said. “Good,” the gym owner said. “Stay with it. You can see what it’s doing for you. The gym owner beamed. “I am, aren’t I,” he said. “I never thought about it that way before.” He thought about it some more, and then he said, “Okay, on Mondays and Thursdays you start off with some Prone Hyperextensions. Do 3 sets of 12 in good style and don’t worry about how much weight you handle. “The idea is to warm up your lower back. “Fine,” the gym owner said. “That’s a good way to look at it. Make it a challenge to improve your squats every workout. Keep piling on the weight. The more weight you put on the squat bar, the more you’ll put on yourself. “I think so,” Eddie told him. “Okay,” the gym owner said. “I’ll watch you run through it the first time, anyway. “Now,” he said, “you go to the chinning bar. Do 3 sets of Wide Grip Chins to the back of your neck, and then 3 sets of Regular Chins. Try to work up to 15 reps in each set. As soon as you can do 15 reps, tie weights around your waist to increase the resistance. The two types of chins will bulk up the big lat muscles in your back and make you nice and wide so you can pack your big arms around. “Now,” the gym owner said, “the final exercise is One-arm Dumbell Presses. You alternate arms and do 4 sets of 10 reps with each arm. Use a light weight for the first set, jump it to your best for the second set, and drop it five lbs. for each of the next two sets. “Keep a good position on the presses. Don’t lean over any more than about 10 degrees. If you do it properly you stand to make some good gains on your deltoids. The gym owner smiled broadly. “Yes,” he said, “I know. “Is two days enough?” Eddie asked him. “It is for now,” the gym owner said. “We’ll make some changes next month, but this is the right amount of work for the time being. ‘Now,” he said, “the first exercise is regular Barbell Curls, 4 sets of 12 reps. Warm up your arms with some light dumbell curls and then go right into the heavy stuff. Use your best weight for the first set and then drop it ten lbs. for each succeeding set. Don’t worry too much about style. Heave it a little bit on the last few reps.
“The next exercise,” he said, “is Close-grip Bench Presses. Keep your hands about thumb’s length apart. Lower the weight fairly high on your chest so that your triceps get most of the work. Do 4 sets for 12 and your arms will know it. Warm up your triceps with a few pushups, start heavy on the presses, and drop the bar ten lbs. each set. “The next exercise,” he said, “is Incline Bench Curls. Do 4 sets of 10 in very strict style. Use your best weight for the first set and drop the dumbells five lbs. each for each of the remaining sets. Let your arms straighten right out at the bottom and raise your elbows high at the top of the movement. “Next,” he said, “you do Standing French Presses, 4 sets of 10. Use good style, your best weight first, and drop the poundage ten lbs. for each of the remaining sets. “The next exercise is a little different,” he said. “It’s Curls with the Lat Machine. You sit under the bar, take it with a close grip, and curl your hands down to the back of your neck. Make sure you keep your elbows pointing to the ceiling the whole time. You’ll get a cramping sensation in your biceps if you do it properly. Do 4 sets of 10 reps with whatever weight you can handle. “And the final exercise,” he said, “is Triceps Extensions with the Lat Machine, 4 sets of 8 in strict style. Make your triceps do all the work and use as much weight as you can for each set. Eddie marched out. The gym owner slid the chess game over, rested his chin on his hand, and studied the pieces for a long while. Finally he picked up the white Knight and looked at it. Eddie Martin ducked into the gym and shook the rain out of his hair. He wiped water off his face and rubbed his hands against his soaked T-shirt. Then he squished his way through the gym and into the office and stood in front of the desk while the rain oozed out of his shoes and formed a growing puddle on the floor. The gym owner raised his head from the book he was reading and looked at Eddie for a long time. “It’s raining,” Eddie told him. Eddie looked down at his York T-shirt, striped flares, and running shoes. “What’s the matter with the way I’m dressed?” he said. “How much did you gain in the last month?” the gym owner asked him. The gym owner took a pad of paper and a pencil and started writing. “For the third month,” he said “we’re going to bear down hard on arm work. The emphasis will still be on gaining weight, but we’re going to try and put almost all of it on your arms. “Keep using the Get Big Drink,” he said. “You’ll need it more than ever. You’ll be working hard and you’ll need all the nutritional help you can get. “Five days won’t be too much, will it?” Eddie asked him. “Do that,” the gym owner said. He scribbled on the paper. “Now,” he said, “you’ll do the bulk and power routine on Tuesdays and Fridays, and the arm program on Mondays, Wednesdays and Saturdays. We’ll take the Tuesday and Friday routine first. “Start off with a good warmup,” he said. you’ll be working hard and lifting big weights and you don’t want to pull a muscle or anything. Put on a good warm sweat suit and spend ten or fifteen minutes doing light snatches, jogging, stretching, or anything else you like. Make sure you’re good and warm before you start the actual workout. “Now,” he said, “the first exercise is Prone Hyperextensions and you should be getting pretty good at them by now. Go way down and work hard for 3 sets of 12. You should have a real tight feeling in your lower back when you finish. “Next,” he said, “come Squats, but this month you’ll be doing lower reps than usual. You’ll do 5 sets of 5 and you should be able to work up into some pretty heavy weights. In fact,” he added, “if you don’t work up into some pretty heavy weights, you might as well forget the whole thing. “Use a moderate weight for the first set,” he said. “Add weight for the second set. Then add more weight and do the third, fourth, and fifth set with all the weight you can handle. “Keep your head up, your back flat, and don’t go below parallel position. Take three huge breaths between each rep, and hold the last breath while you’re squatting. Add weight every workout. You’ll never look really good until you’re squatting with king-size poundage. “Are squats the key exercise in this routine, too?” Eddie asked him. “Squats are the key exercise in any routine,” the gym owner said. “Your gains will be roughly proportionate to the effort you put into squatting. The heavier you squat the more you’ll gain, and without them you won’t gain at all. “So, okay,” the gym owner said. “The next exercise is the Bench Press, but this time you do them in real loose style. Drop the bar fairly rapidly, bounce it, and then arch your back to complete the lift. You can use real heavy weights this way and develop a lot of bulk and power. Do 5 sets of 5 with the same system of progression as the squats – first set light, second set a little heavier, and the third, fourth and fifth set as heavy as you can shove up. “Next,” the gym owner said, “you do Rowing. 5 sets of 5 with the same progression as the squats and the bench press. Use the loosest style possible. Heave with your legs and lower back to get the bar started, and then keep it moving with a strong arm pull. “And finally,” he said, “you do Presses Behind the Neck, 5 sets of 5 with the same type of poundage progression. Do the presses very loose, almost in a push or jerk-press style. Bend your legs slightly, straighten them vigorously to get the bar started, and then finish the press strongly with your arms. “You’ll be doing the arm exercises in pairs,” the gym owner said. ‘You’ll combine a biceps exercise and a triceps exercise and alternate them back and forth until you’ve done the required number of sets of each. “For example” he said, “the first pair is the Cheating Curl and Parallel Bar Dips. You do 5 sets of 8 reps in each exercise and alternate them back and forth until you’ve done the required number of sets of each. Do a set of curls, then a set of dips, another set of curls, another set of dips, and so on until you’ve done 5 sets of each. Drop the poundage slightly each set and work fast. No more than 30 or 40 seconds rest between sets. Use all the weight you can and work to your limit each set. “The next pair,” he said, “is the Close-grip Curl and Lying Triceps Extensions. Use about a 6” grip and do the curls with your back against the wall or a post so that you can’t cheat. Use about the same width of grip for the extensions and keep your elbows pointing toward the ceiling the whole time. “Alternate back and forth,” he said. “A set of curls, then a set of extensions, and so on. Do 5 sets of 8 on each exercise with about 30 seconds rest between sets. “Now,” he said, “take a short break and then you do the final pair of exercises – Barbell Curls on the curling stand and Triceps Pressdowns on the Lat Machine. You do them the same way, 5 sets of 8, 30 seconds rest between sets, and a maximum effort each set. One month later Eddie walked into the office. “How’d you make out,” the gym owner asked him.